When you need to replace the front door of your home, there are several options to choose from when it comes to materials. You can purchase a wood door, a steel door or a fiberglass-composite door depending on your preference. Understanding the features and benefits of each option can help you make the right decision for your home and can save you the trouble of having to replace your door again in a few years. To ensure you are completing the process successfully, there are several steps you must take in advance to avoid issues during the installation process. Measuring the size of your door jamb allows you to select a door option fitting your existing door frame. You must determine in advance whether you need a left-hand or right-hand door before making your purchase. 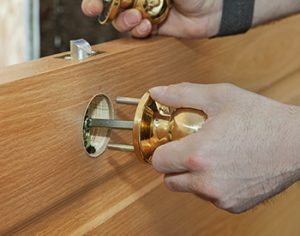 If the lockset for your existing door is on the left-hand side, then you must purchase a left-hand replacement door. More information about the types of doors to purchase is available below. Aesthetically, you can choose the wood type you find most visually appealing, as these materials are durable and long lasting in each variety. An added benefit of choosing a wood door is the material is easy to paint over, and you can choose any paint color you would like to enhance the exterior of your home. When buying a wood door, you want to purchase a furniture-grade veneer to paint onto the wood before it is installed. In doing so, you are protecting the wood from outdoor elements and extending the life of your new door. For added protection and shine you can apply a coat of polyurethane to your wood door, which can be purchased at most hardware stores. Wood doors for your home can be purchased in two main types including stock wood doors and solid wood doors. If you are looking to buy a new door for your home within a limited budget, then choosing from the stock wood options is your best bet as these are typically cheaper than solid wood options. If you are looking for a new door to enhance the security of your home, then purchasing a steel door can help you achieve greater security. Steel doors are stronger and more durable than other options and do not warp over time, meaning you do not have to replace steel doors as frequently. For those who are budget conscious, steel doors are the most affordable option for your new door. Typically, a new steel door costs around $150. You can choose the style and color you prefer, as steel doors come in several options for you to choose from. You may need to repair dents to your steel door from time to time, but this can be easily accomplished with the supplies found in a basic auto-body repair kit. Steel doors are commonly equipped with a finish consisting of baked-on polyester, which means you need to repaint the door periodically to maintain its overall condition. This can be completed during the length of one afternoon, and the minimal upkeep associated with steel doors ultimately makes painting it every now and then easier to manage. It is important to remember steel doors come with hinges attached, meaning you must remove the old hinges from your door frame before you attempt to install your new door. Once you have removed the existing hinges, all you need to do is position the steel door into place and attach the new structure according to the instructions provided. For people who live in humid climates or areas of the country where you experience harsh weather, purchasing a fiberglass-composite door is a durable option for these environments. Fiberglass-composite doors have a similar appearance to wood doors and can be purchased or painted to look like any type of wood you prefer. If you are looking for a new door for your home with the longest warranty and the least amount of upkeep, then purchasing a fiberglass-composite door is a good investment for you to make. These doors are relatively affordable, with most options costing around $200 depending upon the size of the door and the style of finish you are looking to buy. You may need to pay extra for any glazing or hardware you want to add to your fiberglass-composite door, but this is entirely based on preference. If you want to further enhance the durability of your front door, then you can add a coat of glazing to the exterior of the door to ensure it holds up against any severe weather you may experience in your area. If you like the style of door you have found but do not like the hardware, then this can be easily replaced and you may do so within a limited budget. This is an easy renovation you can do yourself. For example, if you purchase a fiberglass-composite door mimicking mahogany wood and the door is equipped with gold hardware and you prefer silver, then you can remove the hardware and replace it with the items of your choosing. Purchase the new hardware and any additional materials such as glaze when you are purchasing your new fiberglass-composite door. In doing so, you are preventing yourself from taking extra time to buy these items after the door has been installed. Complete all projects before the installation process, as it may be difficult to make changes once the door is already in place. You want to be mindful of whether the door can line up with the existing hinges already in place. Be sure to properly measure the door frame and your new door options before making your selection. You do not want to buy a new door and take it home only to realize it is not going to fit within your existing door frame.